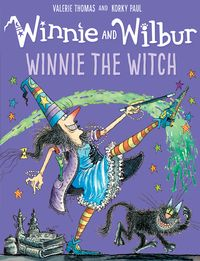 Enjoy a multitude of madcap adventures with Winnie the Witch and her black cat, Wilbur! Valerie Thomas and Laura Owen's wonderfully crafted tales of magical misadventure, coupled with Korky Paul's distinctive illustrations have inspired millions of young readers around the world. 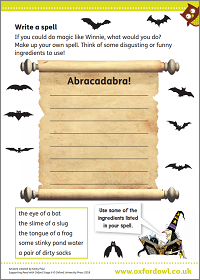 As well as picture books for the under 5s, spellbinding young fiction, and entertaining activity books, we've created a few fun activities for your own little misadventurers! Winnie the Witch - Winnie the Witch lives in a black house. She has black chairs and black stairs, black floors and black doors. Winnie’s cat Wilbur is black, too. And that is how the trouble begins! The Big Bad Robot - When Winnie the Witch makes a cardboard robot, she is very proud of her creation and decides to turn it into a real robot. BIG mistake! 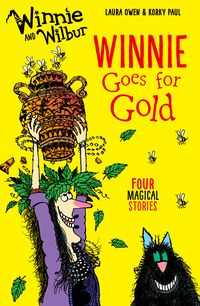 Winnie Goes for Gold - Winnie the Witch decides to open her home to her oddball relatives, does her bit – as only Winnie can – towards saving the planet, is left in charge of a crying baby, and adds a bit of glamour to the school sports day. 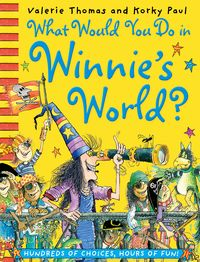 Winnie Spells Trouble - Evil Egyptians, angry aunties, and everyone’s favourite witch! 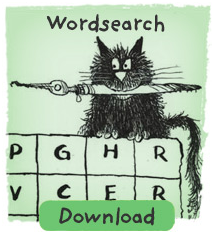 In these four new stories, illustrated by Korky Paul, Winnie is a trouble magnet! Whizz-Bang Winnie - In these four books, a trip to the shops turns into a hunt for a missing Wilbur; a problem with reading doesn’t stop Winnie from bringing stories to life for a class of children, Winnie creates a ‘chocodile’ capable of laying chocolate eggs, and in Winnie gets her skates on in a ‘hot wheels’ race. Winnie Goes Wild - Winnie the Witch shows a little bit of her wild side: solving crimes, making wishes come true, shearing sheep, and swinging from a jungle vine. Spooky Winnie - A close encounter with a mammoth, spooky stories by candlelight, a wand with a mind of its own, and some trick-or-treat magic. Four more crazy adventures for Winnie and Wilbur! 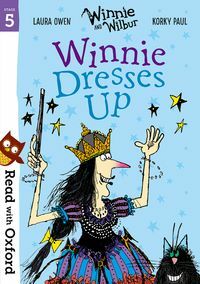 The Winnie and Wilbur books from the Read with Oxford range of books have been carefully created by educational experts to support your children as they become independent readers. Winnie and Wilbur: It's Teatime, Winnie! 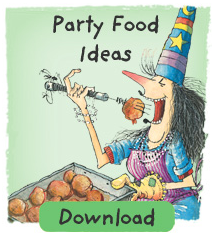 – Join Winnie the witch and her cat Wilbur in two delicious stories with short chapters: 'Winnie Goes Batty' and 'Winnie Grows Her Own'. Winnie and Wilbur: Winnie Dresses Up – In 'Big Top Winnie', Winnie sets up her own circus and wants to be a graceful tightrope walker! In 'Winnie's Fun Run', she dresses up for a fancy-dress race, but not everything goes to plan! 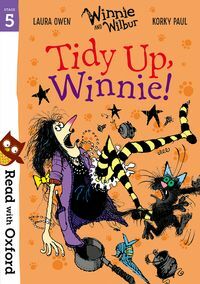 Winnie and Wilbur: Tidy Up, Winnie! – In 'Winnie's Bubble Trouble', Winnie magics up a bubble so she can drift away from all the mess in her house. In 'Winnie Gets Bossy', she decides to reorganise all her furniture - but unfortunately the furniture has other ideas! Winnie and Wilbur: Winnie's Outdoor Fun – In 'Blooming Winnie', Winnie tries to tidy up her garden with some magic, but her wand just won't work! In 'Winnie the Twit', Winnie thinks she's found a very rare kind of owl living in her garden. But who's the twit - Winnie or the owl? 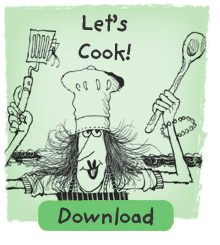 Winnie and Wilbur: Go, Winnie, Go! – In 'Whizz-Bang Winnie', Winnie and Wilbur join a motor race on their broomstick, and in 'Giddy-up', Winnie, Winnie brings her magic to a horse race! 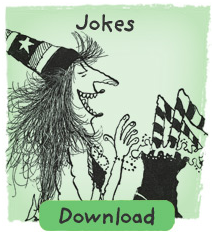 Winnie and Wilbur: Winnie's Problem Pets – Find out what happens when Winnie takes Wilbur – and a lot of fleas – to a pet show in 'Itchy Witchy', and laugh as Wilbur and Scruff the dog try to show Winnie who's best in 'Winnie's Perfect Pet'. 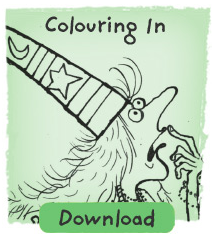 Great fun, these activity books will keep children amused on long journeys or at home. Please note you will need to login or register to access our free eBook library. In 'Winnie's Bubble Trouble', Winnie magics up a bubble so she can drift away from all the mess in her house. Oh no! Winnie has broken her magic wand! Colour the picture and fill in the speech bubble. 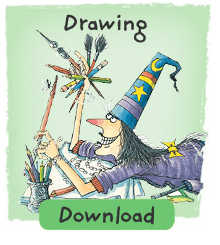 13 magical steps to show you how Korky Paul draws Winnie the Witch from the tip of her hat to her shoes. Can you find the 10 words hidden in the grid? Winnie likes to make people happy! Here are some of her favourite jokes. Winnie would be lost without her cat, Wilbur. 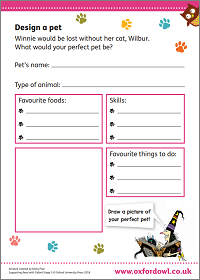 What would your perfect pet be? If you could do magic like Winnie, what would you do?